I GREW UP IN ARGENTINA, traveling with my family every summer and dancing four times a week, so it’s no surprise I continue doing so as an adult. Both dancing and traveling have been essential to making me the person I am today. In the last couple of years, while travelling often or living abroad, I have learnt to appreciate dancing in new ways. The ideas I share here are not only for experienced dancers, but for all kind of travelers and tourists feeling that they need to “move” more. When you’re far away from home, and missing physical contact, couple dancing can be just what we need. During my first month in Australia, I would have died for a simple hug. I didn’t know anyone well enough to ask for it, so I decided to start practicing salsa again. It might seem silly, but holding hands with a dance partner or the open embrace involved salsa saved me. It was the kind of physical contact and support I needed. In time, some of my salsa classmates ended up being my closest friends in that country. So, now you know: whenever you need a hand and you are far away from home, go to a dance class. Dancing classmates tend to be welcoming to diversity. On the dance floor, it doesn’t matter if you are tall or short, queer, straight or LGBT, Asian or Latin American. All it matters is how much you enjoy dancing, how much effort you put into learning, and how well you work with your dance partner or groups. And that means the world to some of us… Other places might be not inclusive for foreigners, but in a dance class it’s almost guaranteed that part of the group will make you feel welcome. Dancing can be a nice routine in a life with no routines, or a break from typical “touristy” activities. For the ones that travel often, like myself, the lack of routine can be tiring too. 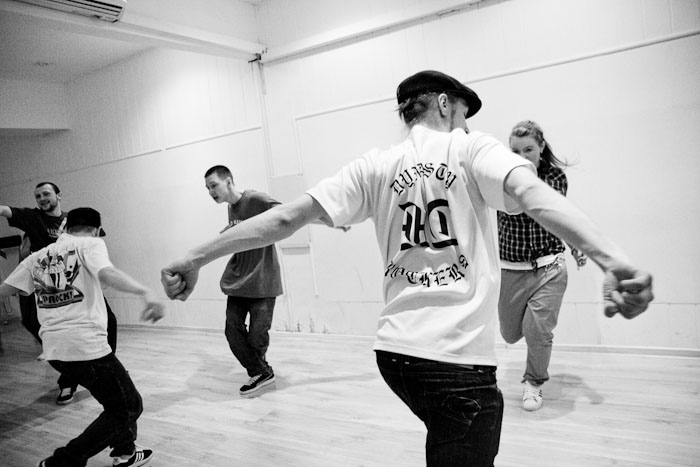 It might also happen that you get sick of being treated like a tourist… So dance lessons are perfect! Taking a dance class allows you to experience how is like to live daily in that city, and social dancing helps you experience the regular nightlife of a city, instead of the flashy nightclubs for tourists travel guides recommend. When I was working as a cultural interpreter in Buenos Aires, I took several academic groups to enjoy a night at a real “milonga” (tango club). It was priceless for them to experience it! In my own free time, wherever in the world I am, I tend to prefer Lindy Hop events. One of the crazy paradoxes of travelling is that sometimes it’s hard to meet locals. Some travelers only hang out with other travelers at a hostel, and in some cultures, people don’t just talk to strangers they meet in the street. The space of a dance class or social dancing is the perfect excuse to interact with locals that share your preferences in music and/or dancing style. That, in itself, is a small but significant base from which to build a beautiful friendship. I must say, some people use dancing as a dating strategy. I was never into that, but it is also true that I know many couples who have met on the dance floor. Who knows, maybe you’ll meet the love of your life during a bachata night in Japan! Many dancers are travelers themselves, so they will understand what we are going through, including the cultural shocks. Globalization also means more dancing seminars, conferences, competitions and international events (not to mention dancers that go on world tours). It is possible to find excellent salsa dancers in India, swing dancers in Korea, flamenco experts in Argentina o belly dancers in the United States. The last five years, while traveling, even the dance instructors I met in small towns were travelers themselves, and they were aware of cultural differences. For a traveler-dancer, meeting open-minded people like that is priceless. Let’s just state the obvious: dancing makes fantastic physical activity! It’s a fun workout, doesn’t matter if you are in the beginner or advanced class. Just be mindful of your body, don’t push yourself too much and prevent getting hurt… just like in every other activity, you have to care for your wellbeing to be able to continue enjoying it. Learning about traditional dances and music instruments is a fast and active way to get to know a certain culture. One of the best experiences I had in Japan was a Taiko class. Taiko are typical Japanese drums played in a choreographed way. It didn’t take me long to discover similarities with Argentinian drums (“bombo”)… Excited with my findings, I told my Taiko instructor, who seemed genuinely interested in learning more about the bombo. When I suggested staying after class and chat, the instructor suddenly froze. It didn’t take me long to realize Japanese people have very different etiquettes for making invitations and that it takes them longer than Argentinians to trust someone they’ve just met. Dancing helps to be present, focused, attentive even to the smaller things going on inside you and around you. In other words, dancing is one of my favorite ways to practice mindful meditation principles. Being present is good, no matter where you are: home or abroad. When I have a problem, when I miss my loved ones, when I’m worried about something, dancing helps me bring myself back to the present time and place. The only things I have to care about are being in time with the rhythm, coordinating my footwork, spinning and keep on dancing. This is one of the reasons I believe dancing kept me sane when I move abroad to work and study for two years and I went through hardship. You’ll meet super interesting people who dare to live “outside the box”. In my personal experience, some of the most amazing people I’ve met dance. They dance different styles, for different reasons, with different skills, but they dance nonetheless. It has always been easier to find unconventional individuals that understand we are all different on the dance floor than anywhere else. “Locos lindos” we say in Spanish, crazy fun. You know, the kind of people who are not afraid of looking like a fool. And one can never have too many friends that are crazy fun and unafraid of looking like a fool.